I have been on the water almost everyday here on my brothers new little run about which is great for the kids with high sides and all. The difference from the other four times I have been here is that I am not involved in running around for a race boat in fact I haven’t even been near the yacht club. Instead lots of quality time with the three kids at the beach, in the pool or at the museum, zoo or aquarium. As it is also May it is also not as hot as I am used to. Perfect weather for me to get rid of the white antarctic skin! Off to the UK on Monday to get ready for RBIR. I got to Bermuda today to spend a week with my family and see my dog. 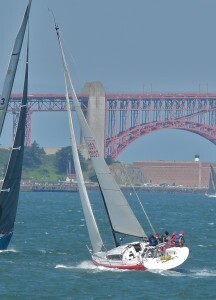 I had a great 10 days in San Francisco including racing on Rhum Boogie out to the Farlonnes and numerous meals with friends. Us on the way out to sea. My dog Draeger wont let me out of her sight and my nephew is requiring full attention and numerous hugs and kisses. Life is good for me 🙂 My nieces are shy as they don’t really know me but they are also giving me hugs and kisses and are running around the place walking. With them being identical it will probably take me a few days to figure out which one is which!